A centuries-old making tradition meets modern life. Published on Monday, January 21, 2019. This article appears in the December/January 2019 issue of American Craft Magazine. 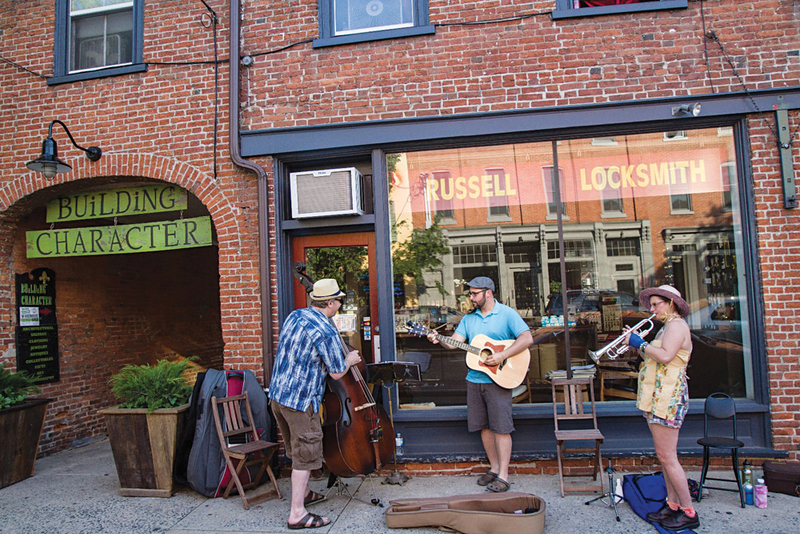 Set amid Amish farm country, Lancaster has a 350-year-old history and vibrant craft roots. On a sunny Saturday morning, downtown Lancaster, Pennsylvania, vibes with an easy energy. Iced coffees in one hand, dog leashes in the other, people pause to watch bands at outdoor stages for the 10th annual Launch Music Festival. 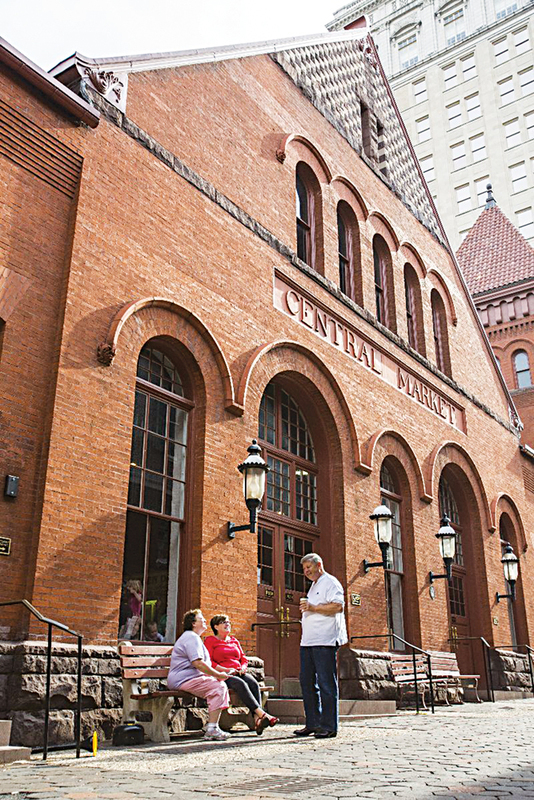 Residents and tourists stroll the aisles of the historic Central Market, a 300-year-old farmers’ market known for prepared foods and locally sourced cheese, produce, and meat, much of it from Amish vendors. At Tellus360, a downtown pub and music venue, Creatively Lancaster’s makers’ market is in full swing. About 40 local vendors display their art and handcrafted goods, while a singer croons upbeat folk tunes and shoppers sip pints of local microbrews. 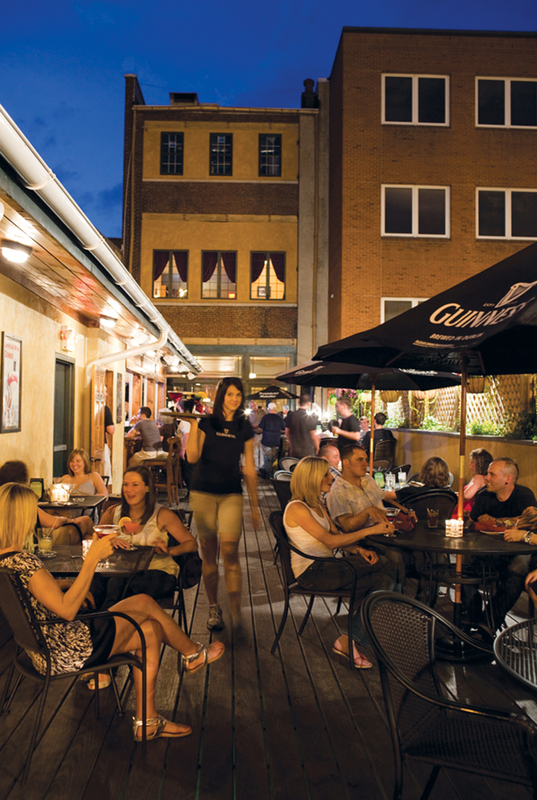 This urban scene is about a 20-minute drive from the horse-and-buggy farmland of Amish country. Located some 80 miles west of Philadelphia – travel stories have dubbed the city of 60,000 the “new Brooklyn” – Lancaster features trendy craft beers and art markets, but Creatively Lancaster founders Steph Fleetman and Christine Miller say the modern-day crafting community isn’t so far removed from its forebears, known especially for their woodworking and quilting traditions. We still have those roots – that Pennsylvania Dutch, make-it-yourself, DIY spirit – but this is the new renaissance of that,” explains Miller. Realm & Reason functions as both a boutique and a community gathering place. The store sells clothes and jewelry (including work by co-owner Emily Moccero), as well as gift items such as greeting cards and bath bombs. It also hosts a new show by mostly local artists every month. Creatively Lancaster hosts makers’ markets all around the city, popping up at pubs and shops. 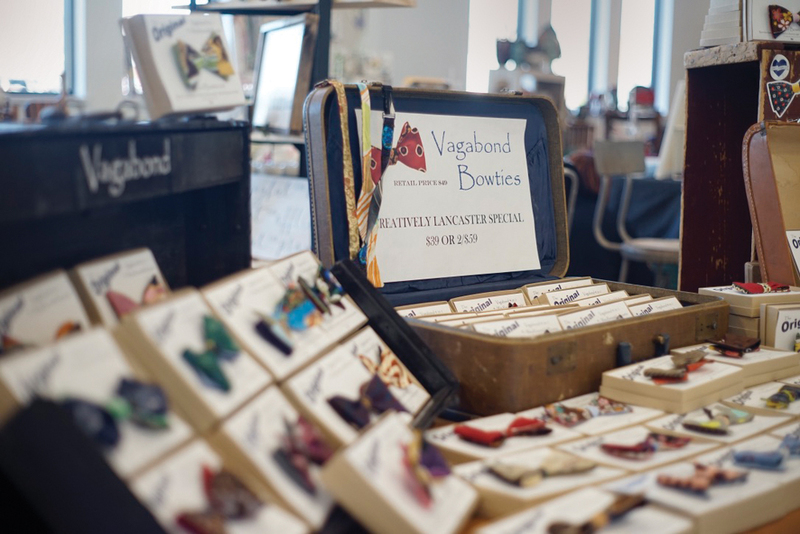 Patrons can find wares by local makers such as Vagabond Bowties, Dazzling Daizy Designs, and Dovekie & Finch – and, in the tight-knit Lancaster scene, rub elbows with the makers themselves. 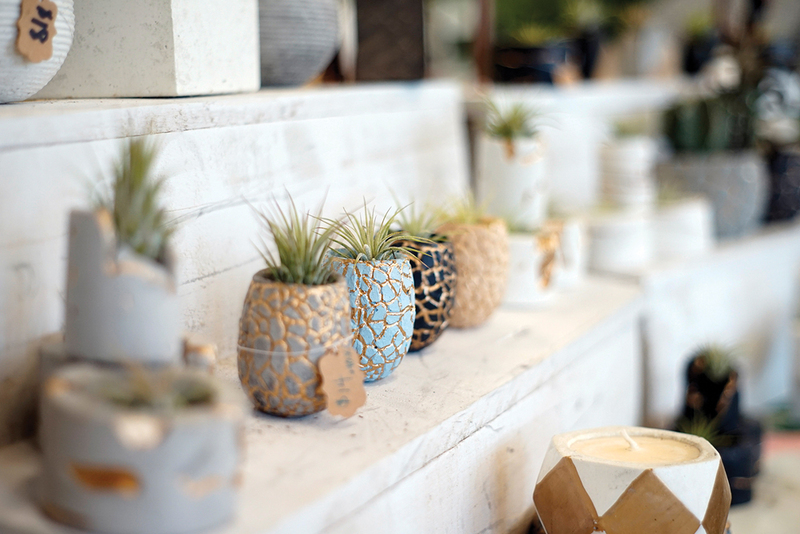 The warehouse complex Building Character houses some 60 merchants selling handmade and vintage goods, including Henschel Trees ceramics, items of reclaimed wood by Urban Legacy, and leather work by Michael Glick. A compact downtown offers arts and nightlife options such as Annie Bailey’s Irish Public House. The 300-year-old farmers market, in an 1899 building, offers a wide range of edibles from nearby farms. 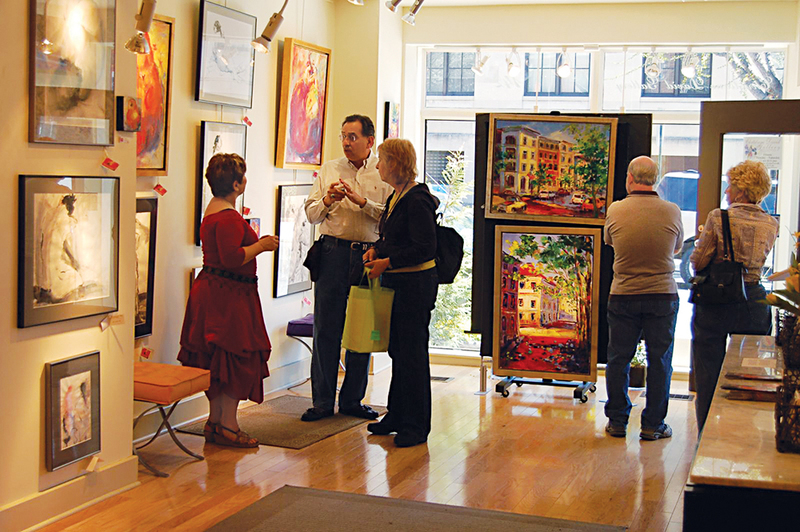 The 100 block of Prince Street, known as Gallery Row, is the city’s artistic heart; it beats especially strong on First Fridays. 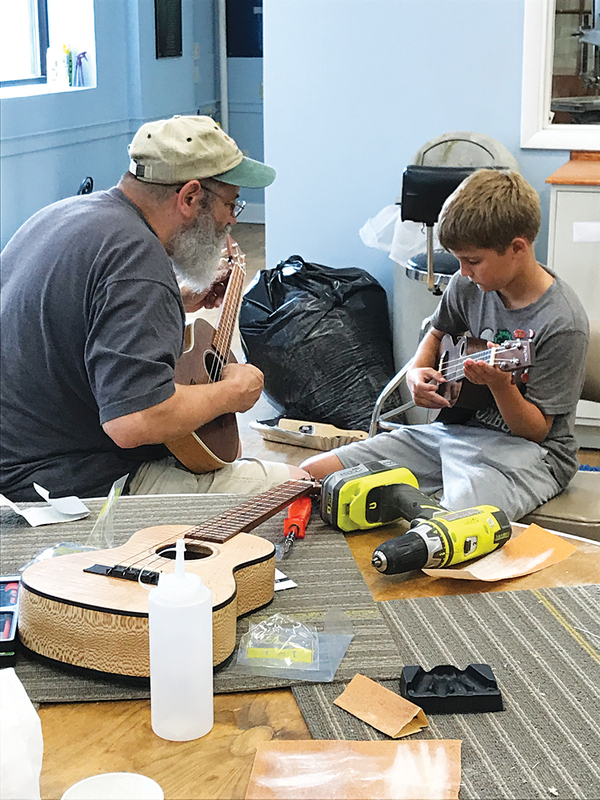 Pennsylvania Guild of Craftsmen: The group offers a wide range of hands-on classes in its Lancaster headquarters, as well as craft fairs in Philadelphia, about 80 miles away. Take Hannah Schmittel of Reclaim Supply Co., who makes jewelry from tree branches she salvages in her yard. When she finds a piece she likes, she’ll slice it with a band saw, sand it down, then coat it with lacquer and resin before turning it into earrings or a pendant. Schmittel says she picked up her woodworking skills at a young age, passed down from her mom’s Mennonite side of the family. From her perch as one of its leaders, Fleetman says the city’s arts scene is thriving. 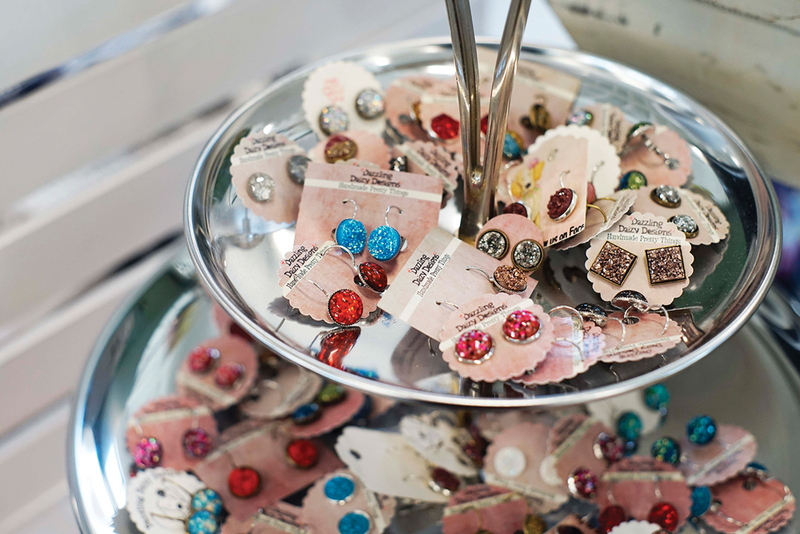 She and Miller, who previously owned [Re]chic, which upcycled vintage items into jewelry and home décor, launched the first Creatively Lancaster market in September 2017; held at various venues, the markets, they say, are a way to foster a community for the local talent. 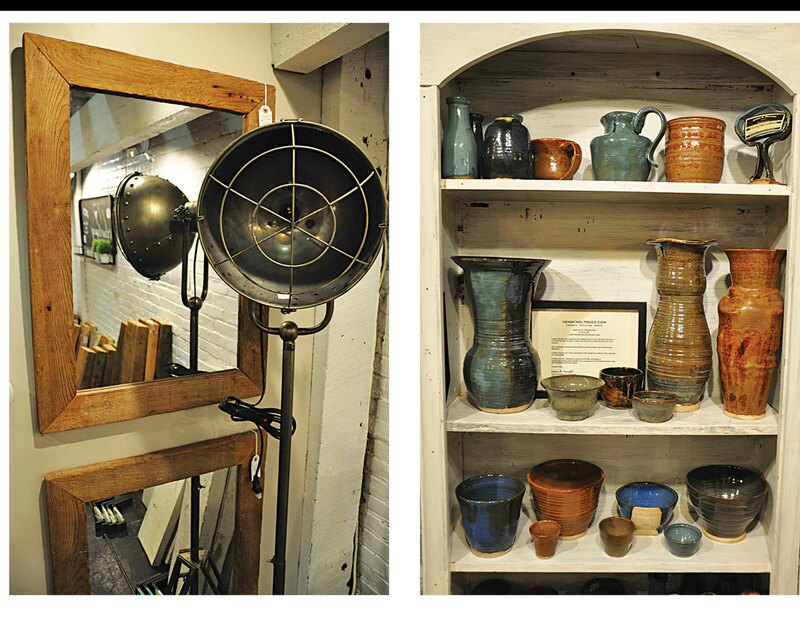 Permanent brick-and-mortar spaces help anchor the scene. 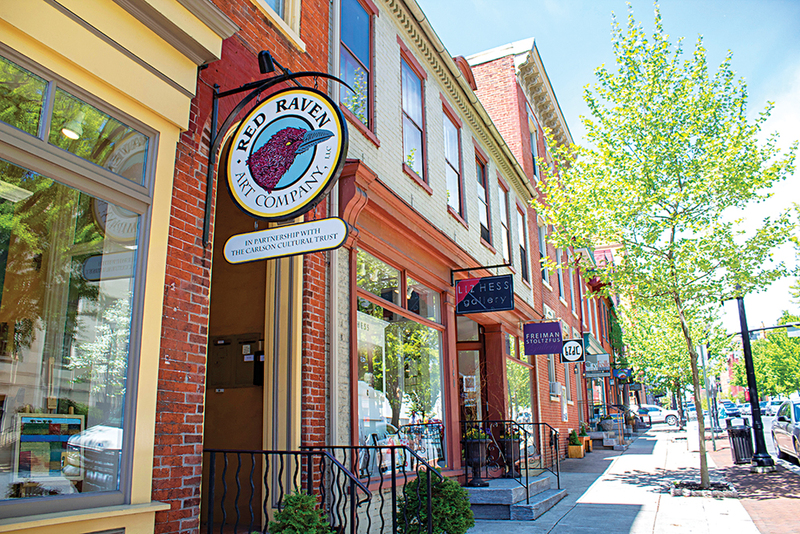 Lancaster’s downtown shopping district boasts a cluster of art galleries, boutiques, and retro general stores. The 100 block of North Prince Street, dubbed Gallery Row, packs in about a half-dozen galleries bookended by the Pennsylvania College of Art & Design, which has its own gallery space. 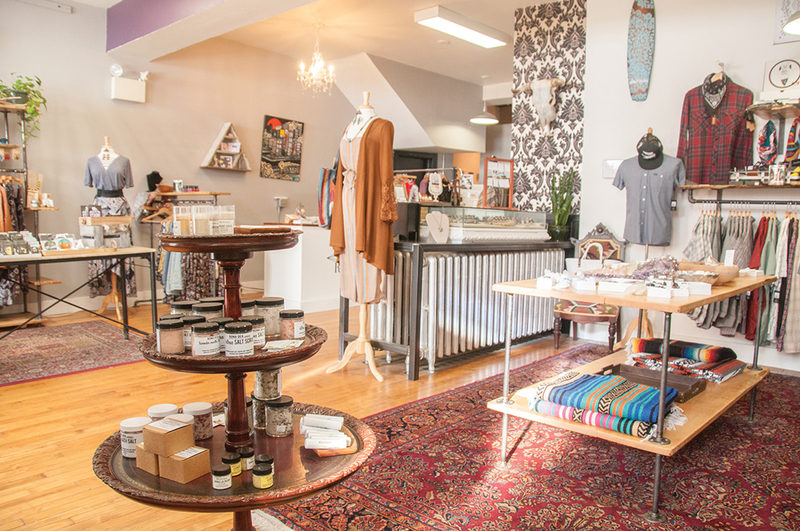 Some nearby shops combine efforts, like Realm & Reason, a clothing boutique that doubles as an art gallery-event space and showcase for co-owner Emily Moccero’s jewelry. There’s also the 300 Block, a hub of galleries, cafés, and boutiques along North Queen Street, where you’ll find Building Character, a multi-warehouse marketplace of more than 60 merchants offering vintage, recycled, and handmade goods. Residents flock to First Fridays every month, when businesses stay open until 9 p.m., galleries debut new exhibitions, food trucks park on Lancaster Square, and live music spills into the streets. 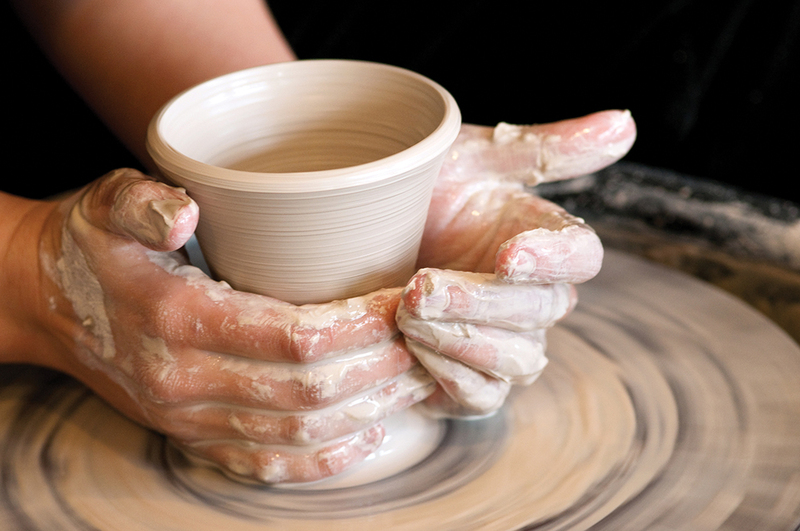 Locals who want to make something with their own two hands can attend weekly workshops at the Pennsylvania Guild of Craftsmen in mediums including jewelry, ceramics, and glass. Those who just want to get their feet wet can sign up for Craft on Tap, the guild’s monthly make-and-take session that pairs with a complimentary beer from local Wacker Brewing Co. 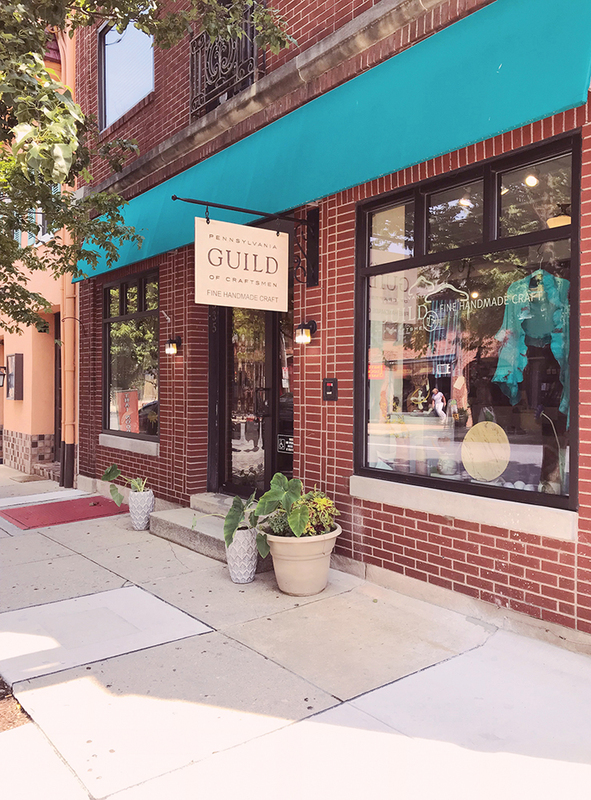 The guild also has a boutique filled with work by Pennsylvania artisans, and on First Fridays, visitors can watch artists demonstrating their craft. 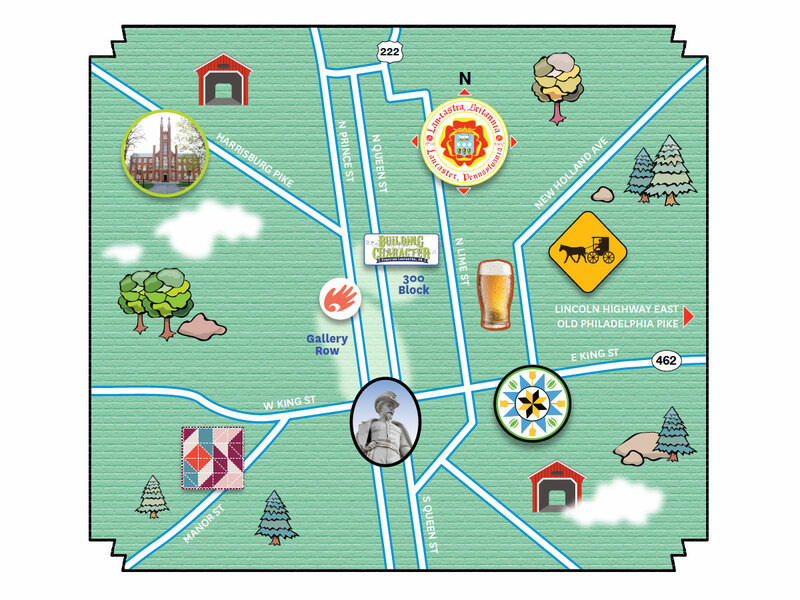 For a more rustic environment, drive down Lincoln Highway East or Old Philadelphia Pike. You’ll pass countless Amish furniture outlets packed to the gills with traditional wares: dining room sets, beds, chests, you name it. 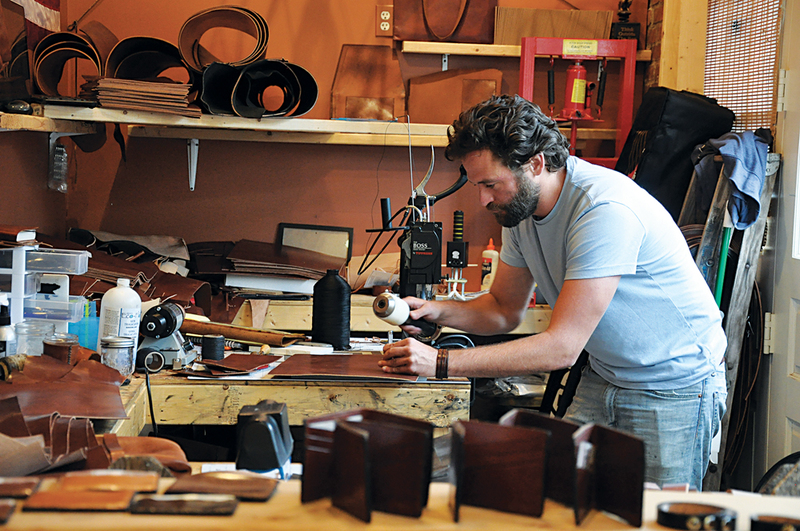 Back downtown, you’ll feel the pulse of the maker scene that’s happening right now – and building. Look for new exhibitions in the 100 block of Prince Street during First Fridays each month or stop in any time during open viewing hours. Artisans Gallery presents local work in a range of mediums, including jewelry and sculpture. At the end of the block, the Pennsylvania College of Art & Design hosts regular exhibitions in its front gallery space. Need a beer? Head a few blocks south on Prince and one block east on West King to the Spring House Brewing Co. Be sure to soak up the suds with a pretzel braid and spicy whole-grain mustard. The district actually encompasses several blocks of North Queen Street, where you’ll find galleries, vintage shops, cafés, and boutiques. Fuel up with coffee and brunch at Commonwealth on Queen before window shopping. At Madcap & Co., come for the American-made and fair-trade goods, stay for the retro candy counter. 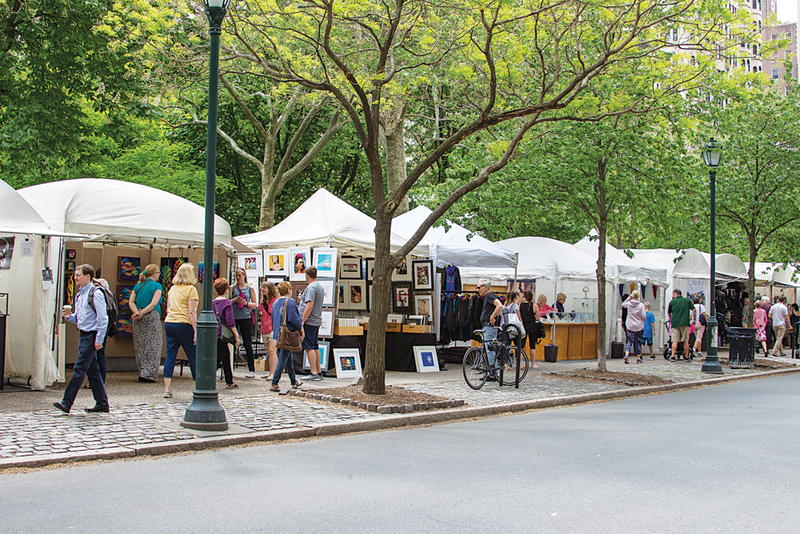 Browse the craft store at the Pennsylvania Guild of Craftsmen; on First Fridays, visiting artists offer live demonstrations on-site. If you’re in the mood to wander a while, check out Building Character, a multi-warehouse marketplace featuring more than 60 vendors selling vintage, recycled, and handmade merchandise. The space also houses the Heritage Press Museum, a vintage-style print shop that hosts weekly demonstrations in the art of letterpress. About a 15-minute drive east of downtown, you’ll find yourself in Amish country: long stretches of farmland dotted with roadside furniture outlets and quilt shops. Out on Lincoln Highway East, just past the Dutch Wonderland amusement park and the Amish Farm and House, which offers tours and education on Amish history and heritage, grab a slice of traditional shoo-fly pie at kitschy attraction Dutch Haven. Amish Stuff Etc., located behind Dutch Haven, is known for its cedar chests. Next door at Dutchland Quilt Patch, you’ll find handwoven quilts, along with home décor. About a 10-minute drive north to West Newport Road, visit Fisher’s Quality Furniture, a family-owned store and showroom of handcrafted bedroom sets, dining room tables, and custom cabinets.